I am a historian of working people and the labor movement in the United States. I have written on gender, race, and unionism in the United States railroad industry in the late nineteenth and early twentieth centuries. 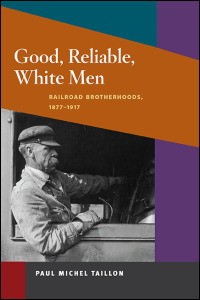 Good, Reliable, White Men, Railroad Brotherhoods, 1877-1917 (Urbana: University of Illinois Press, 2009). I teach the survey of United States history at Stage I, a course in the making of modern America during the late nineteenth and early twentieth centuries at stages II and III, and "Uncovering United States History" at postgraduate level. In 2017 I offer History 108, "Rise and Fall of the USA" in Semester 2 and History 257/357, "The Making of Modern American: The USA, 1877-1924," also in Semester 2. Samuel Denny, "'How It Could Have Happened in a Civilized Country I’ll Never Know': The Bisbee Deportation of 1917 and the Struggle for Industrial Democracy in the American Southwest’s Hard Rock Mining Industry," MA. Editorial Board, Australasian Journal of American Studies. Taillon, P. M. (2017). Labour Movements, Trade Unions and Strikes (USA). 1914-1918-online. International Encyclopedia of the First World War (pp. 1-10). Berlin: Freie Universität Berlin / Bayerische Staatsbibliothek. Related URL. Taillon, P. M. (2016). Review of the book: Free Labor. The Civil War and the Making of an American Working Class, by Mark A. Lause. H-Net Reviews Related URL. Taillon, P. M. (2015). The spirit of 1919: Labour, race and revolution. Auckland, New Zealand. 11 August - 22 September 2015. Taillon, P. M. (2015). Review of the book: Progressives at War: William G. McAdoo and Newton D. Baker, 1863-1941, by Douglas B. Craig. Australasian Journal of American Studies, 34 (1), 100-102. Semester 2, 2018: Thursday, 1-2pm, Friday, 1-2pm.